Finishing up with our walking tour of Goldfield, we head off the main boulevard (Crook Street/U.S. 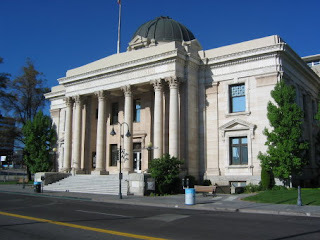 95) and wander the side streets of this historic mining town, which is located about 240 miles south of Reno via U.S. 95. For example, on the corner of Ramsey and Euclid avenues is the former Goldfield High School, built in 1907. Sadly, the school has been vacant since the 1940s and has deteriorated in recent decades (although efforts have been made to stabilize the building). The school is a two-story stone and brick Georgian Revival-style building that sits atop a half-story full basement, which makes it seem even larger. The entrance is enhanced by wide wooden steps leading into an elegant archway and vestibule. During the town’s boom, the high school accommodated more than 400 students. Down the street, at 206 E. Ramsey Avenue, is the Southern Nevada Consolidated Telephone-Telegraph Building, once part of the town’s commercial district. Constructed in 1906, the building is a one-story, stone structure, which has a full basement containing much of the phone company’s original wiring and relays. The building is significant because the Southern Nevada Consolidated developed the first communications systems in Goldfield. It extended its telephone and telegraph lines from Tonopah to Goldfield in 1904. By 1907, when Goldfield was teeming with more than 20,000 people, the phone company was bursting with activity as it tried to keep up with the demand for communications services (records indicate revenues in excess of $250,000 in 1906). The town began its long decline after 1913, but the phone company managed to survive for another five decades before finally closing its doors. Today, it is in fairly good shape (it was used as an apartment for a number of years) and is one of only seven commercial or public buildings made of stone that are still standing. Adjacent to the phone company building is the Goldfield Consolidated Mines Company Building, also known as the Nixon and Wingfield Block. 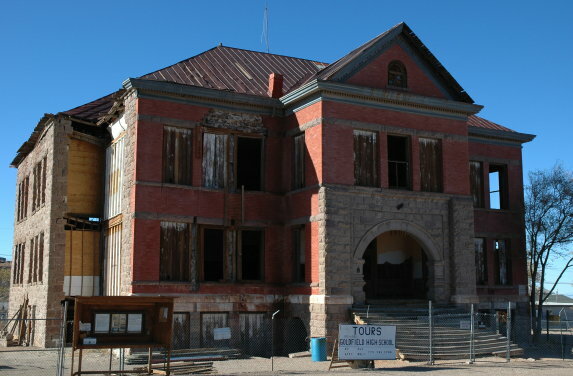 This three-story stone structure is probably the third-most impressive building in Goldfield (after the Goldfield Hotel and the Esmeralda County Courthouse). Built in 1907, this was the nerve center of the Goldfield mining empire of Senator George Nixon and financier George Wingfield. Nixon and Wingfield dominated Goldfield’s mining industry during its early boom period. By 1907, they had purchased controlling interest in nearly all of the productive mines in the district. A year later, Wingfield acquired Nixon’s share in the company and virtually ruled the town’s mines until 1932, when he suffered financial setbacks as a result of the Great Depression. Directly next door to the Goldfield Consolidated Building is the Curtis and Ish Building, also erected in 1907. The Curtis and Ish is a three-story concrete and stone structure that utilizes a Neo-Classical Revival style. The impressive commercial building was constructed by two successful Goldfield businessmen, Loren B. Curtis and Marvin E. Ish. Curtis was owner of the Nevada Power, Mining and Milling Company, which supplied electrical power to Goldfield and Tonopah. Ish and his brother were mine developers, who made nearly $1 million from the Mohawk Mine (later acquired by Wingfield). Across the street from the Goldfield Consolidated Building is the less auspicious Elks Building, built in 1925. This was one of the last substantial structures erected in the town, having been built on the foundations of the former Tonopah & Goldfield Railroad Building, which was destroyed by fire in 1923. A couple of ruins worth noting are the former sites of the Montezuma Club and Sideboard Saloon. The Montezuma Club (on Columbia Street) was once the most influential and powerful social institution in the town’s history. Its members included the richest and most successful businessmen in Goldfield. The Sideboard Saloon ruins are noteworthy because of the unusual 12-foot, round, stone arch—once the entrance—that stands in an empty field. The original building was erected in 1907 but destroyed in the 1923 fire. The last building of significance is the Santa Fe Saloon, built in 1905. This modest wooden drinking establishment is located well outside of the main commercial portion of Goldfield but adjacent to the town’s mining fields. The Santa Fe is one of a handful of businesses that have managed to stay open in Goldfield for the past century. It’s a classic frontier-style saloon with a wooden false front and sidewalk. Inside, it boasts a century-old backbar, uneven floors and plenty of authentic, old Goldfield character (or characters, depending on who’s there). For more information about Goldfield, contact the Goldfield Chamber of Commerce, 165 Crook Ave., P.O. 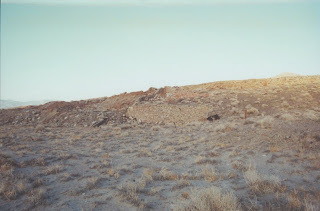 Box 204, Goldfield, NV 89013, 775-485-3560, http://www.accessesmeralda.com/Goldfield_Demo.htm. This week, we’ll continue our walking tour of the mining town of Goldfield, once Nevada’s largest and most influential community. Wandering the dusty streets, and seeing the dozens of building foundations and decaying, abandoned structures, it’s clear that Goldfield was once a substantial place. Founded in 1902, it had more than 20,000 residents by 1907, then declined almost as rapidly as it rose. 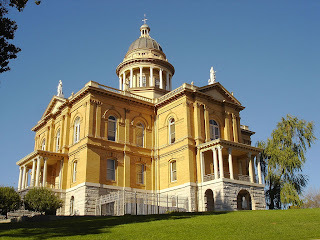 Across the street from the magnificent Goldfield Hotel (on U.S. 95, which runs through the center of town) is the impressive Esmeralda County Courthouse. Built in 1907-08, this two-story, stone structure is perhaps the best-maintained building in town. 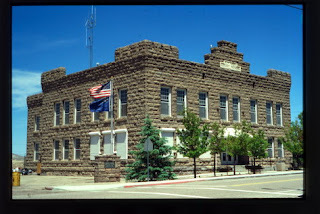 The courthouse, which is still in operation since Goldfield remains the seat of Esmeralda County, is an outstanding example of an early 20th century hall of justice. The building’s exterior is composed of course, rockface stone. It has a tall, stepped parapet at the roofline above the entrance and notched walls at the four corners of the building—all of which give it a dramatic castle-like appearance. Inside, the courthouse has finely crafted wood staircases, ornate light fixtures and expensive courtroom furnishings, including original Tiffany lamps. 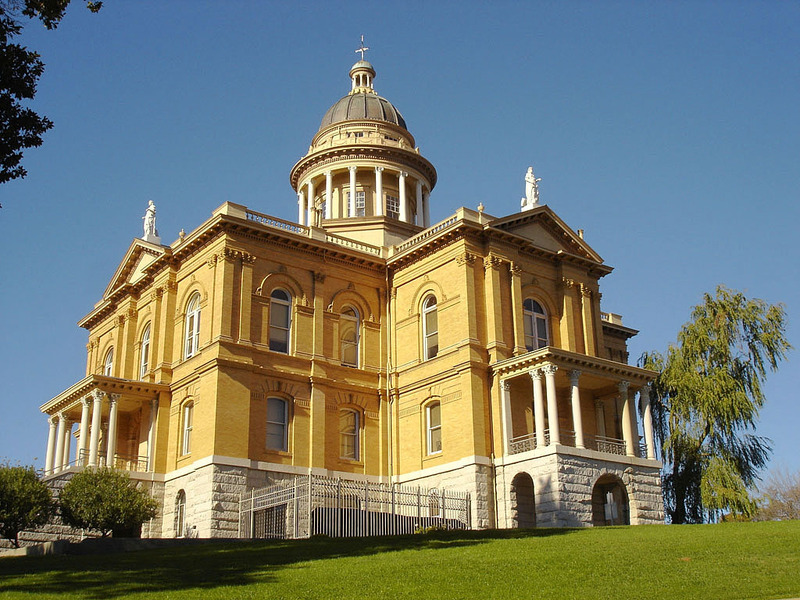 The courthouse reflects the political muscle once exerted by Goldfield. When gold was first discovered in Goldfield, Hawthorne, located 125 miles north, was the Esmeralda County seat. As Goldfield grew, its community leaders became unhappy with the expense and inconvenience of having to deal with such a distant county seat for business transactions. So, in 1907 Goldfield wrestled the seat away from Hawthorne (which later was able to regain its status as a county seat when Mineral County was created from part of Esmeralda County). Adjacent to the courthouse is another of Goldfield’s better preserved survivors, the First M.E. Church of Goldfield. With architecture that echoes the courthouse, the church was built in 1912, just as Goldfield was beginning to slump. The church is a single-story structure with an articulated, square bell tower that rises 30-feet. While its facing resembles the courthouse’s stonework, the church was constructed with rusticated blocks, which is concrete that is cut and molded to resemble stone. Across Crook Street (U.S. 95) is the E.A. Byler house, which has the distinction of being one of the few bottle houses remaining in Nevada. This residence, built in 1905, was actually constructed of used beverage bottles that were covered with adobe. In places, some of the adobe plaster has worn off, exposing the bottles. Continuing down Crook Street, there are several other significant structures to be seen, including the 1908 Goldfield Fire Station No. 1, still used as a fire station. This simple, rectangular, two-story stone building was paid for by the people of Goldfield, who raised half its cost by donations (the county paid the rest) and erected it using donated land and labor. Near the firehouse is the ornate G.L. “Tex” Rickard house, probably the finest of the original boomtown homes still to be found in Goldfield. The flamboyant house was built in 1906 by Rickard, co-owner of the Northern Saloon and promoter of the 1906 Gans-Nelson championship boxing match, held in Goldfield. Rickard is one of the more interesting persons drawn to Goldfield during its boom. The publicity he generated for the Gans-Nelson fight catapulted Goldfield into the national consciousness as an up-and-coming mining community, which helped its mines attract eastern investors. Rickard later built and managed the first Madison Square Garden in New York. Another unusual house is the Charles S. Sprague home, a one and a half story structure located at the intersection of Crook and Sundog avenues (at the place where U.S. 95 turns sharply south). The Sprague place, built in 1907, was one of Goldfield’s most substantial homes. 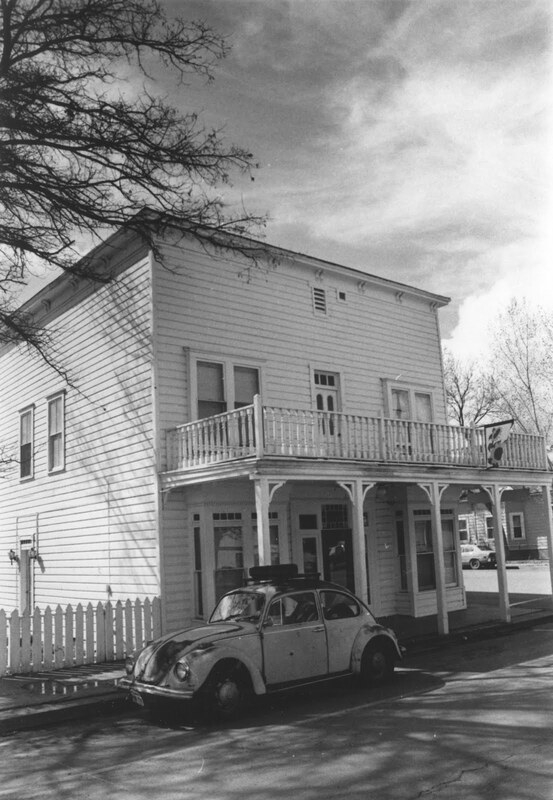 Sprague was owner of the Goldfield News and a prominent Goldfield businessman, who served as Esmeralda County’s state senator during the 1920s. The house has a steep, gabled roof that extends the length of the house and is noteworthy for its large size and unique design, which architectural historians describe as Craftsman Bungalow style. Over the years, it has been used a residence and commercial business, most recently as a restaurant. Still more on Goldfield next time. Years ago I stopped in the historic mining town of Goldfield when an elderly woman carrying a bag of groceries walked up to me as I climbed out my car and practically demanded that I give her a ride home. Amused by her boldness, I consented and drove her to her house, which was an old, tumbled-down, stone building covered with a red, rolled asphalt roof. I followed her inside. She placed her paper sack on a wooden table near the door and began to describe her unusual house, which seemed to consist of a long hallway lined with doors on either side. Customers entered through the front door, as we had, she said, paid their money to someone sitting behind a desk near the entrance, then went into the room of their favorite working girl, if she wasn’t already occupied. There were six small rooms, three on each side of the building. In addition to the hall door, each had an exterior door with window. She took me down the hall to a small room in the back of the building. She pointed up to a bucket on a hinge that was attached to a wooden beam in the roof. A rope hung down from the bucket. She explained that this was where the girls took showers. We walked outside and she told me that the area around her brothel had once been Goldfield’s red light district, home of the town’s houses of prostitution, dance halls, and seedier saloons. I don’t remember much else of what the old woman said that day but I thought of her recently when reading in Sally Zanjani’s book, “Goldfield,” that at one time 500 girls worked in the city’s red four-block light district. Of course, Goldfield, which is located about 200 miles south of Fallon via U.S. 95, was much more than a large tenderloin section. At its peak in 1907, the town had a population of more than 20,000 and a developed area that covered more than 50 city blocks. Wandering the streets of Goldfield, you can find that the ghosts still speak loudly. They talk of better times—when Goldfield was the largest community in Nevada and the hub of the state’s political and economic power. And they murmur of bad breaks, like the tapped-out mines, fires and floods that hastened the city’s demise. Goldfield traces its beginnings to two miners, Harry Stimler and William Marsh, and a Shoshone named Tom Fisherman. 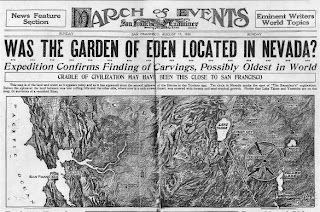 Just after the turn of the century, the latter apparently discovered gold in the mountains south of Tonopah. In 1902, he led Stimler and Marsh to his find and within months a small mining camp had developed. The site was originally called “Grandpa,” supposedly because Marsh declared it was going to be the granddaddy of all mining camps. Interest in the camp was modest until 1903, when additional gold discoveries were uncovered. The following year, a townsite was plated, which was named Goldfield. Goldfield boomed from 1905 until about 1910, when it entered an extended period of decline. Despite its relatively short time at the top, a great number of substantial buildings and homes were constructed in Goldfield. A disastrous flood swept through the town in 1913, destroying dozens of buildings and accelerating the town’s depression. The coup de grace, however, was a major fire in 1923, which burned most of the town’s commercial district. Today, Goldfield remains one of the most vivid reminders of Nevada’s early 20th century mining boom period. In spite of disasters, neglect and decay, more than 100 historic structures have survived more or less intact. Walking its dirt streets (the only paved road is U.S. 95, which runs through the middle of the town), you can still find plenty of buildings that help tell Goldfield’s story. Starting at the north end of town (driving on U.S. 95 from Tonopah), you pass Columbia Mountain (on the left), site of the area’s most significant gold discoveries. The first ore found there was apparently extremely rich—which helped generate the initial enthusiasm for Goldfield—but the deposits were not particularly deep, which is why the mines had such a limited life. Just beyond the mountain, the highway curves east and enters the town, where it becomes known as Crook Street. For a half mile or so, you pass other ruins and dilapidated structures on either side of the road before reaching the center of Goldfield, which you recognize because its the location of the town’s most significant survivor, the Goldfield Hotel. Constructed in 1907-08, this massive four-story brick building rises 56 feet high and can be seen from miles away. The hotel was once the most luxurious in the entire state with an elevator, overstuffed, leather lobby chairs, crystal chandeliers and other elegant features. 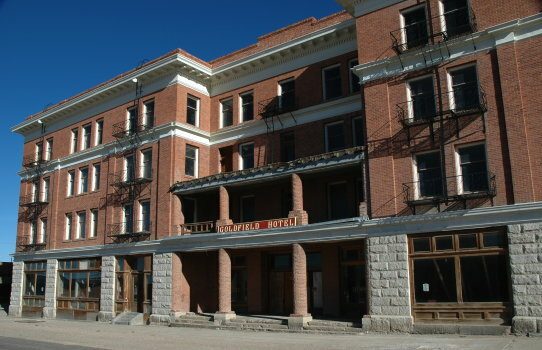 The hotel was financed by one of Goldfield’s largest mining consortiums, the Hayes-Monette Syndicate, at a cost of more than $250,000. Shortly after is completion, it was sold to George Wingfield, who controlled most of Goldfield’s mines and was an influential political and business force in Nevada during the first quarter century. While the hotel managed to stay open until the 1940s (and avoided serious damage during either the 1913 flood or 1923 fire), it has not operated for several decades. In the mid-1980s, the structure was partially restored by a San Francisco millionaire, who hoped to reopen it, but the work was never completed. More on Goldfield next time. Hoover Dam is easily Nevada’s most famous dam. But did you know there are others that are equally historic? In honor of Hoover Dam’s 75th birthday this year, I’d like to take a look at some of the Silver State’s most noteworthy and historic dams. Bishop Creek Dam—Originally called the Metropolis Dam, this structure was built in 1912 to provide water to the farming community of Metropolis, 20 miles north of Wells. But downstream farmers won a lawsuit contesting the dam and it has never been used to its full potential. Fill in the dam included brick rubble from the 1906 San Francisco earthquake. More recently, the state has begun work to replace this decaying concrete dam with an earth fill dam so this historic wedge will soon be gone. Wild Horse Dam—There are actually two Wild Horse dams. The first one was built in 1937 to store water to irrigate hay meadows on the Duck Valley Indian Reservation, 60 miles north of Elko. Poor construction rendered the dam unsafe, so in 1969, a second, larger dam was built upstream from the original. The first dam still stands beneath the waters of Wild Horse Reservoir. Angel Lake—As dams go, the one creating Angel Lake, 12 miles south of Wells, is small, measuring a mere 15-feet across. Built in the 1880s, this dirt-and-rock barrier is one of the state’s oldest dams and creates a picturesque alpine lake. Cave Lake—The earthen dam creating this scenic mountain lake is so low profile that most visitors don’t realize Cave Lake is a manmade reservoir. Nestled in Eastern Nevada’s Schell Creek Range, Cave Lake was created by a rancher in the 1920s and enlarged in 1961 by the Nevada Division of State Parks. A 27-pound, five-ounce brown trout, a state record, was caught here in 1984. Davis Dam—With its blocky, angular design, this dirt-fill and concrete slab looks the way a dam ought to look. Located on the Colorado River, 67 miles downstream from Hoover Dam and a mile north of Laughlin, Davis Dam was constructed from 1946 to 1953 and created Lake Mohave. Lahontan Dam—This impressive concrete, earth, and rock dam has distinctive design touches, such as an elegant archway and suspension bridge leading to an outlet tower. Constructed in 1911-15 as part of the Newlands Project, the dam captures water from the Truckee and Carson rivers, and then feeds it to nearby Fallon area farms. Marlette Dam—Part of the oldest water system in Nevada, this dam was constructed on Marlette Lake in the 1860s by the Carson and Tahoe Lumber and Fluming Company. In 1877, a series of flumes and pipelines were built to carry Marlette’s water to Virginia City. 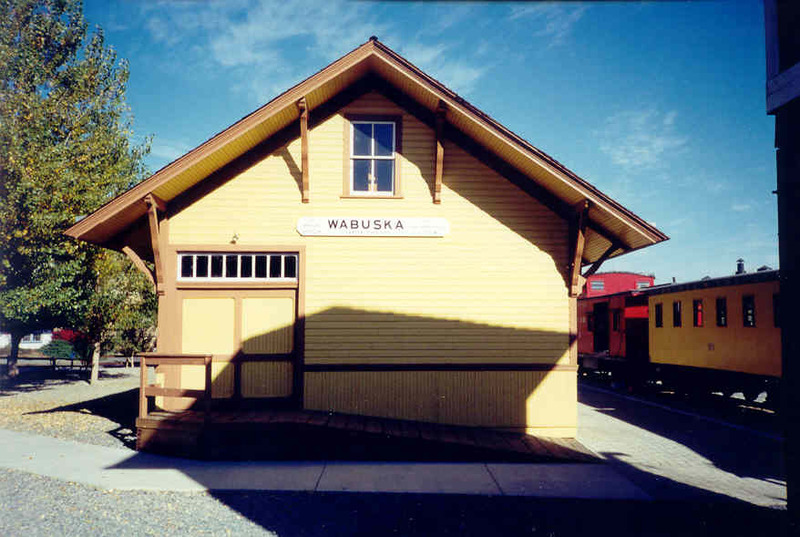 The system was one of the engineering marvels of the 19th century, transporting water from high in the Sierra Nevada range, down 2,700 feet to Washoe Valley, across the valley, and back up 1,400 feet to Virginia City. Tahoe City Dam—Sitting at the north end of Lake Tahoe, this dam is the spigot that pours water into the Truckee River, which provides nearly all the water for Northwestern Nevada. Built from 1909-1913, this 14-foot concrete sluiceway raised the level of Lake Tahoe by more than six feet—which translates into 732,000 acre feet of water—despite vehement opposition from shoreline property owners. 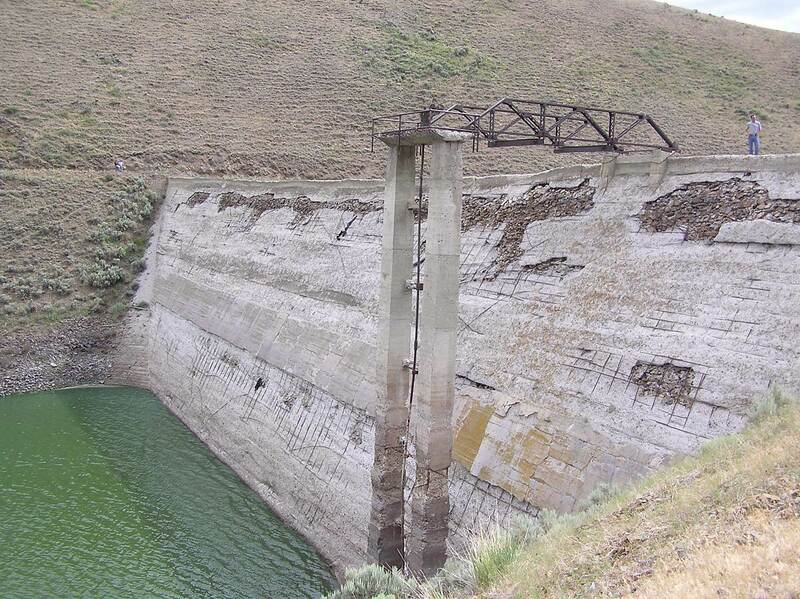 Derby Diversion Dam—This concrete dam is one of Western Nevada’s most controversial barriers. As part of the Newlands Project, it diverts Truckee River water to Lahontan Reservoir. The diversion helped turn Fallon into an agricultural center but also sparked nearly a century of legal squabbling over water rights. Derby is located 20 miles east of Reno. Despite the fact that very little remains of the old Nevada mining town of Rawhide, the place refuses to fade away. Perhaps it’s because of its colorful name—Rawhide—which conjures images of western false storefronts, saloons with swinging doors and old prospectors wandering the streets with their burros and pickaxes. But while once upon a time Rawhide may have been able to boast all of those iconic features, it’s been a long time since anyone has been able to belly up to a bar in that community. 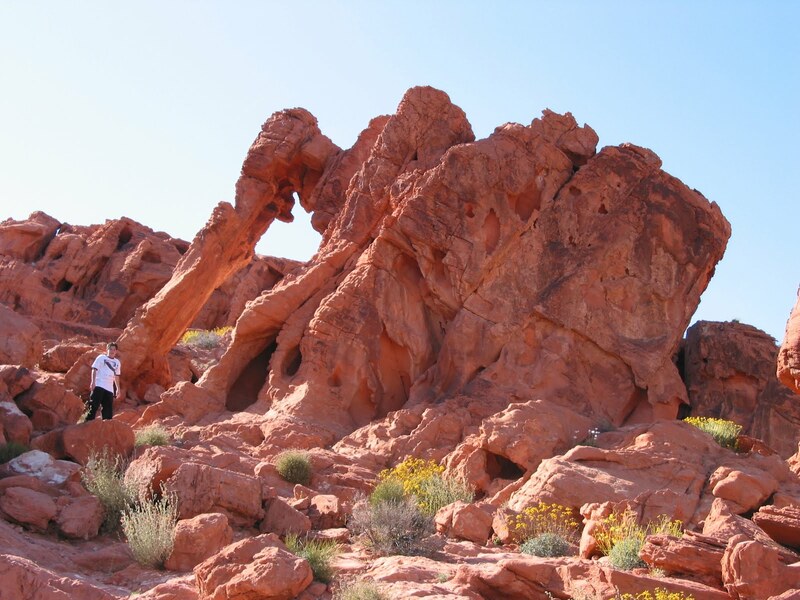 Rawhide trace its beginning to December 1906, when a miner named Jim Swanson is said to have found gold in the area, which is west of the Buckskin Mountains of central Nevada. A few months later, Charles Holman and Charles McLeod joined Swanson in working the site. Holman, in fact, is credited with naming the town. Allegedly, he called it Rawhide as a play-on-words to indicate his dislike for a nearby mining camp called Buckskin, which had tossed him out. McLeod and Holman staked several claims on a mound that became known as Hooligan Hill. Their holdings proved promising and they sold them to a larger mining operation for $20,000 plus 10 percent of the profits. By the end of 1907, word about Rawhide’s riches had spread and it became a classic Nevada mining boomtown that swelled to about 7,000 people. 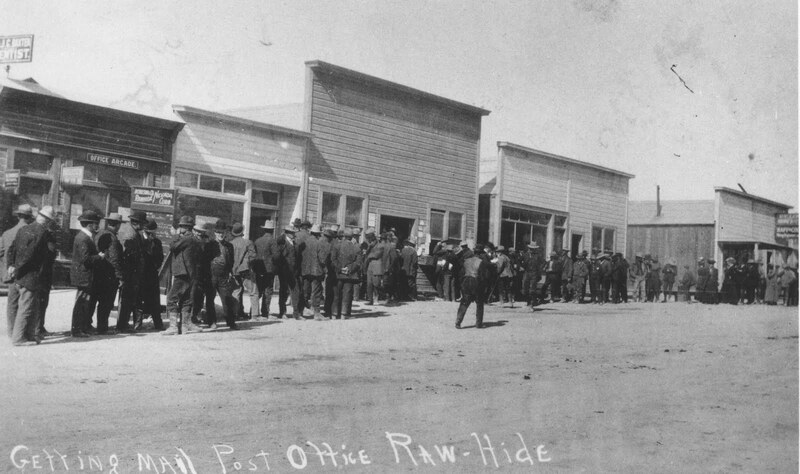 The rush to Rawhide attracted a number of well known—and notorious—Western figures including Bill “Swiftwater” Gates, who had made a fortune in the Alaska gold rush, as well as “Diamondfield” Jack Davis, who occasionally worked as an enforcer and strike-breaker for Goldfield’s mining boss, George Wingfield. Additionally, among those early residents was George Graham Rice, a legendary conman who reportedly had embezzled about $100,000 from investors during the earlier Goldfield mining boom. 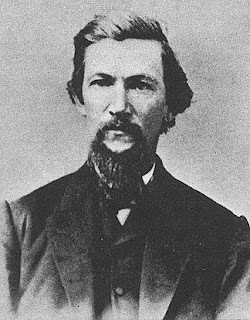 Other, more reputable arrivals included George “Tex” Rickard, who opened a bar in Rawhide called the Northern, and invested in several local mines. Despite all the interest and feverish activity, Rawhide’s glory days were brief, less than a half dozen years. One of the town’s main challenges was a lack of a water source. The precious liquid had to be hauled in from a distant well and was sold at the incredible price of 5-cents per galloon. Still, at its peak Rawhide had a telegraph and long distance telephone service as well as three banks, five newspapers, a half-dozen restaurants, several dozen shops and hotels, more than 30 saloons, a school and a thriving red light district known as Stingaree Gulch. It was also served by a daily automobile-stage with mail service from several surrounding communities. In September 1908, however, tragedy struck the town when fire destroyed a third of a mile of local businesses and residences. While some of Rawhide was immediately rebuilt, the community didn’t entirely recover as mining revenues began to dip. Less than a year later, the Rawhide boom was over. Most of the population moved on to other, more promising communities. By the 1920s, Rawhide was almost completely abandoned. But while the town didn’t last very long, it did make an impression. 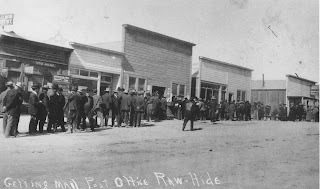 In 1908, famous British romance novelist Elinor Glyn came to Rawhide to get the flavor of a real Western town for her books and wrote about her visit. Rawhide also experienced several unsuccessful railroad-building attempts. 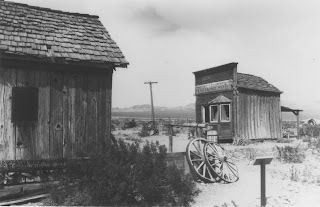 The closest to becoming a reality was the Rawhide Western Railroad, which would have linked the town to the Nevada-California Railroad at Schurz. With less than three miles of grading to be completed, the railroad line was abandoned after investors bailed following the 1908 fire. Today, virtually nothing remains of old Rawhide. Modern mining operations can be seen in the area but there is little to mark the town beside a small cemetery. Even the original Rawhide Jail has been relocated to the city complex in Hawthorne. A non-profit group, www.rawhidenevada.org, is working to develop a permanent historic display in Rawhide (funded by Kennecott Minerals) that will tell the history, geology and folklore of the community. 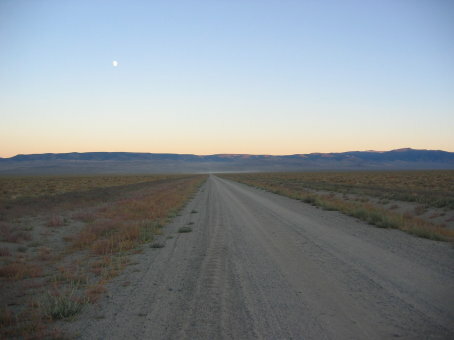 The former site of Rawhide is located about 55 miles southeast of Fallon via U.S. 50 (go about 30 miles), Nevada State Route 839 (turn right and continue another 10 miles) and about two miles of dirt roads. Crowds, Starbucks and traffic jams are just some of the things you won't find in California’s Mono County. Instead, travelers passing through this part of Eastern California will find plenty of beautiful landscapes, interesting history, fascinating geology, friendly towns, fishing, hiking, camping and a host of other places to see and things to do. To reach Mono County from Carson City, you just head south on Highway 395, through the Carson Valley, and into California. You cross into Mono County about an hour south of Carson City. 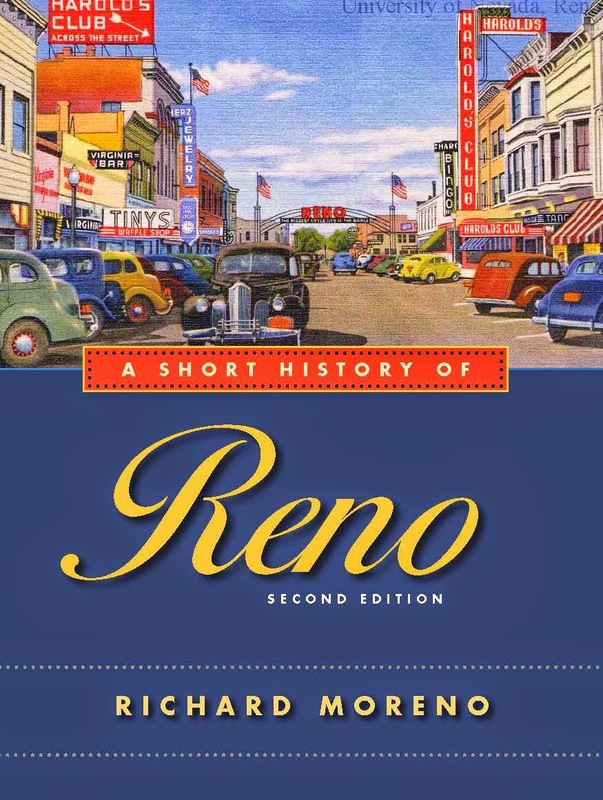 Mono County dates to about the same time that Nevada gained territorial status. The county was created in 1861 and was the first of the mining counties organized on the eastern side of the Sierra Nevada in California. On a map, the county is long and narrow, averaging 108 miles in length and some 38 miles in width. It includes more than 3,000 square miles, wedged between the crest of the Sierra Nevada and the Nevada state line. The focal point for the county is the community of Bridgeport, located about 85 miles south of Carson City. Bridgeport, which is the county seat, developed during the late 19th century and fortunately has retained many of the historic buildings and flavor of its early years. Perhaps the most prominent landmark in Bridgeport is the county courthouse. 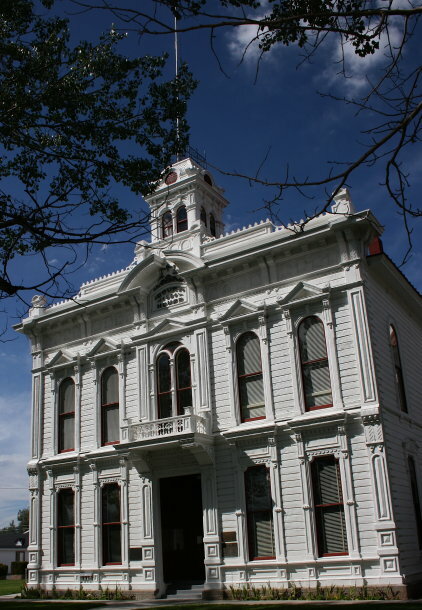 Built in 1880, this three-story white wooden structure, which remains in use, features classic Italianate architecture and is topped with a square cupola and flagpole. Behind the courthouse is the original jail, a simple square stone building constructed of native rock that was used from 1883 to 1964. Slightly to the west of the jail is one of the best places to learn about the history of the area, the Mono County Museum (760-932-5281), housed in an old schoolhouse. The museum is open 9 a.m. to 4 p.m. Tuesdays through Saturdays. Inside this traditional white and green schoolhouse you will find an interesting array of artifacts including a fine collection of handmade baskets woven by local Paiutes, antique furniture, firearms, farming equipment and a great collection of historic photographs. 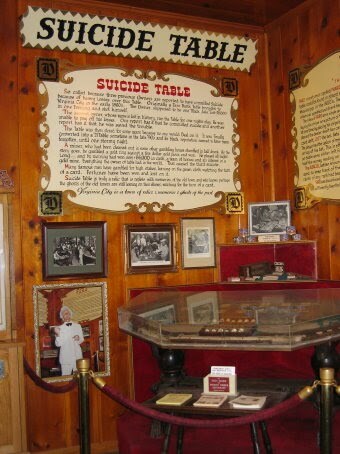 The latter displays include a large number of scenes of the nearby ghost town of Bodie, now a California state park. Adjacent to the museum, visitors will also find a pleasant community park with picnic tables. Bridgeport also contains a number of businesses, such as gas stations, motels and restaurants, geared for the traveler. The surrounding area is very beautiful as Bridgeport is located in a large valley surrounded by spectacular mountains. In fact, the mountains southeast of the town are the northern border of Yosemite National Park, certainly one of the most beautiful scenic areas in the world. The eastern entrance to Yosemite, at Tioga Pass, is located about 30 miles southeast of Bridgeport via 395 and State Route 120. This road takes you through the Tuolumne Meadows and winds around to the magnificent Yosemite Valley in the heart of the park. Directly north of the town is Bridgeport Lake, a popular reservoir that offers camping and fishing. There is also quality recreation available at the Twin Lakes, located about five miles southeast of Bridgeport. 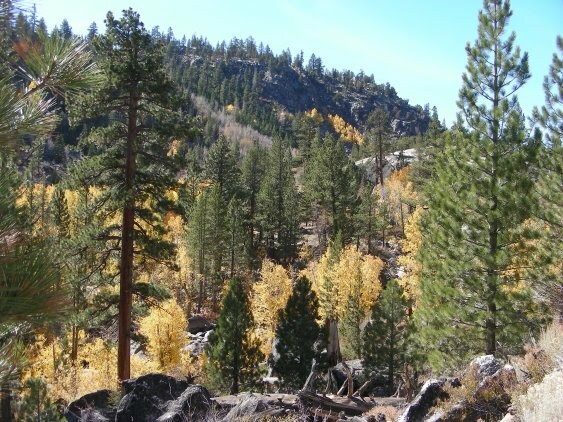 The south end of Mono County includes a couple of well known skiing areas, Mammoth Lakes and June Lake as well as Crowley Lake, said to be one of the best trout fishing lakes in the Sierra. A particularly scenic detour from Highway 395 is to take State Route 120 east to Benton (go opposite of 120 to Yosemite), then head south on U.S. Highway 6 to Bishop, where you reconnect with 395. This drive takes you through some remote but picturesque areas, including the Chalfant Valley. For more information contact the Bridgeport Chamber of Commerce, 760-932-7500 or go to http://www.bridgeportcalifornia.com/. 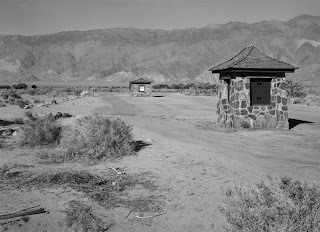 Looking at the vast, empty landscape of the Manzanar National Historic Site, it’s difficult to imagine that it was once the location of a veritable city containing more than 10,000 Japanese-Americans, who were forced to live there for three years. The Manzanar Historic Site, located adjacent to U.S. 395, five miles south of Independence, California (about 4 hours south of Fallon), commemorates the war relocation center which was operated there from 1942 to 1945. 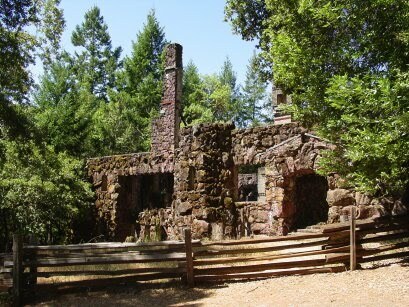 While little remains of the original buildings that were once spread across 6,000 acres in the shadows of the Sierra range, the site is considered to offer the best opportunities for interpretation of the WWII relocation program (there were nine similar camps in the U.S.). The Manzanar camp was commissioned shortly after the 1941 bombing of Pearl Harbor. In early 1942, President Franklin Roosevelt signed Executive Order 9066, which called for people of Japanese ancestry living on the west coast (most of whom were American citizens) to be placed in relocation camps. More than 110,000 Japanese-Americans, mostly Californians, were immediately moved to racetracks, fairgrounds and other makeshift detention centers in California before being transferred to the ten permanent detention centers (Manzanar was the first permanent camp). Within months, the Manzanar camp had 10,000 residents who lived in rows of simple, wooden barracks surrounded by barbed wire fences, secured by guard towers. Additionally, the site included gardens, orchards, ponds, auditorium, cemetery, reservoir, airport, sewage treatment plant and hospital complex. The camp operated until late 1945, then the war ended and the last resident was released. Shortly after, the trailer-like barracks were sold at auction and removed from the site. Today, the best-preserved building is the auditorium, a large, square, green building that is used as an Inyo County maintenance shop (it’s surrounded by yellow public works trucks and other equipment). You can also find the stonework shells of the small, pagoda-style police post and sentry house, near the site’s entrance, as well as portions of other buildings. Most impressive are the stone and concrete walls of two buildings found southwest of the sentry house. Poking through the overgrown sagebrush and grass, you can also find concrete steps that once led up to the barracks, portions of the water and sewer systems and remnants of rock gardens. Wandering the site, try to imagine this was a bustling community that once contained rows of trees teeming with apples and pears (most of the trees are gone) and gardens overflowing with produce. While today, the existence of the detention camps might seem an overreaction, it is best to view the unfortunate episode in the context of wartime. Prior to its use as an internment camp, Manzanar was an early Owens Valley agricultural settlement (1910 to 1935), which is when many of the remaining handful of trees were originally planted, and a prehistoric home for centuries to native Paiutes and Shoshone tribes. The Manzanar Historic site was established in March, 1992. In recent years, the National Park Service has installed interpretive signs and reconstructed one of the guard towers (there were once eight towers). You can also find an excellent display of Manzanar photos, recollections, drawings, paintings and artifacts at the fine Eastern California Museum in nearby Independence. For more information, call 760-878-2194 ext. 2710 or go to http://www.nps.gov/manz/index.htm.